I don’t think I’ve ever poured more of myself in to a challenging painting quite like this newest painting! 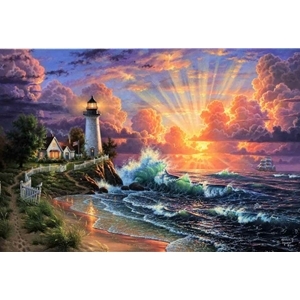 It is a 36″x24″ oil painting titled “Light of Hope”. It is the east coast sequel to a piece I did two years ago called Light of Faith, and you all have no idea how excited I am to share it! I worked on it for weeks and weeks, and hundreds of hours! When I started this piece, I wanted to paint a striking and bold painting that would inspire hope and life in the heart of everyone that saw it. The light of the Son rises bringing warmth and hope for the new day. Glimpses of comforting angels adorn the dazzling sky. The Spirit is like the lighthouse. It warns us of rocks, gives light during the storm, and guides us. We are invited to draw near and rest beside the beach, smell the aroma of the garden flowers, and find shelter in the beach house. By keeping the light shining brightly at our home, we are a light to others in the stormy seas of life. The sailors aboard the distant vessel have endured a long night on the high seas. As the sun breaks, they see the land and sail on in renewed hope of finding their way home. I kind of see myself as the sea gull on the gate to the left.. I am constantly observing, pondering, and quietly soaking in my surroundings, and as I see each day unfold, I strive to capture each tiny little drama I witness on canvas in my efforts to connect with each of you. But, I think all of us deep inside feel like we are the ship at sea. Life is full of waves and storms. Sometimes even the feeling of being home is nowhere inside of us, and the heaven’s light doesn’t shine when we want it. I just want this painting to inspire you to keep going. “I know the plans I have for you” says the Lord, “plans to prosper you and not harm you, plans to give you hope, and a future”. I hope you share this painting with all of your friends to spread the glad tidings of hope and future with everyone you know! Thank you for giving me the chance to share this painting with you!